Ishan Uday Scholarship Program was launched in the year 2014 by University grant commission and Ministry of Human Resource Development with the aim to promote higher education in northeastern states of India (Arunachal Pradesh, Assam, Manipur, Meghalaya, Mizoram, Nagaland, Sikkim and Tripura). 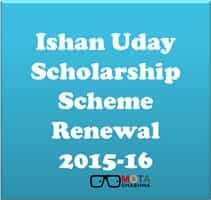 Ishan Uday Scholarship Scheme is in its second year and the students who were selected for the grant of the scholarship last year can apply for the renewal of the Ishan Uday scholarship. As per the information provided by University Grants Commission, Ishan Uday Scholarship will be kept renewed for the duration of first Degree Course subjected to the conditions that the beneficiary will maintain a good conduct during his/her course and will also maintain prescribed attendance in the institution. The scholarship will be continued for the candidates who were unable to get promoted to next class because of unsatisfactory academic performance but in case the candidates are unable to clear his examinations in the second attempt, the scholarship will be forfeited. In case a candidate is unable to appear in the examination because of health issues and/or on account of any unforeseen event, the scholarship can be renewed for the next year on the submission of medical certificates and other related proofs to the Head of the Institution. The beneficiary students who change their college will continue to get the benefits of the scholarship provided that the new college/institution and its course are recognized. The progress of the selected scholars will be monitored by the Head of the Department of the Institution. The students selected for Ishan Uday Scholarship need to deposit quarterly continuation certificate signed by Head of the Department of the Institution in the designated branch of the nominated bank. The Scholarship will be discontinued in case the student fails twice in a row. The scholarship of those students will be forfeited who opt out of studies without prior approval of UGC. These students also need to refund the amount of scholarship which they received.